Lose That Girl: RATE IT! DQ's Largest Cake! Ah, to be in Canada's capital! Tomorrow, June 30 -- one day before Canada's birthday on July 1st -- Dairy Queen, the brilliant brains behind BLIZZARDS!! 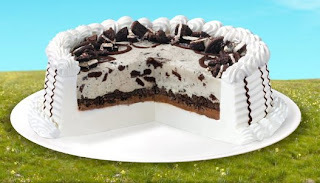 -- will be marking Canada's festivities with the largest EVER Dairy Queen ice cream cake! Want some?? Do I have to ask? Just pop by Confederation Park in Ottawa around noon tomorrow, and nab yourself some creamy frozen joy! Donations to the Children's Miracle Network will be gladly accepted so you won't feel *too* guilty about partaking in some decadent dessert fun. And it's for Canada's birthday... so you HAVE to indulge! Wish I was there! Have a slice or two for me, okay?